Surface quality and surface appearance of extruded aluminum is of such a nature that, in some cases for a number of applications, aluminium finishing is not required. Because aluminum has such a good resistance to corrosion, surface treatments are rarely necessary to achieve protection against corrosion. In the extrusion of machine components and load-bearing structures, surface treatments are very rarely needed, as the surface finish already meets satisfactory levels. The quality of the extruded aluminum is not affected by its surface finish. 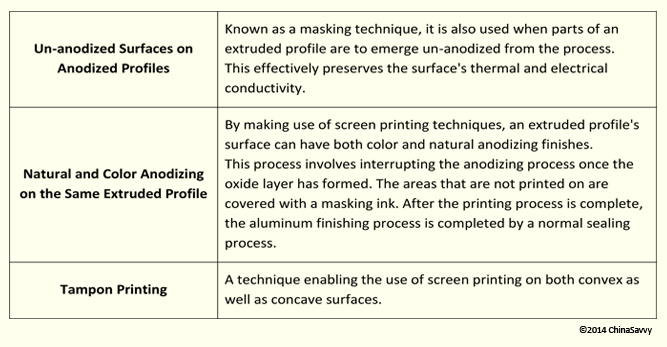 One of the most common surface treatments used for aluminium finishing, anodizing is a process used in order to increase the translucent film of the aluminum oxide or, to increase the thickness of the natural film already present on aluminum extruded surfaces. You can learn more about the Anodizing Process by visiting our Anodizing Aluminum Fabrication page. Enhance the surface's resistance to corrosion. Give aluminum surfaces a coating that is electrically insulating. Create a 'dirt repellent' surface so that it meets strict hygiene requirements (seen in aluminum extrusions used for food processing). Creating a function specific surface finish (this is seen in abrasion resistant or slip surfaces in machine parts). Maintain a surface's 'as-new' appearance. Create a base 'coat', readying the surface for the application of printing inks or other adhesives. Provide a decorative aluminium finishing that has durable colors and a gloss. By anodizing aluminum surfaces, manufacturers are able to achieve an increased resistance to corrosion. This is especially true in cases where the pH is between four and nine. 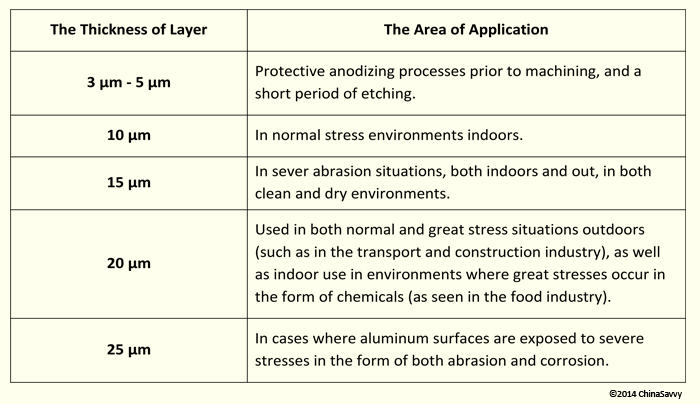 When in contact with strong, alkaline substances, aluminum surface are subject to damage. This is seen on construction sites where extruded aluminum parts can come into contact with gypsum, lime and cement. By covering the visible surfaces with tape, this damage can be prevented. The hardness of the oxide layer formed on the aluminum extruded surface, is dependent on the anodizing technique used. Generally, the oxide layer formed is harder than glass and as hard as corundum (a crystalline form of aluminum oxide that has traces of chromium, titanium and iron). Oxide layers formed during the anodizing process is transparent and, whether it is colored or natural, its appearance will depend on the viewing angle. Note that, above 100°C, fine cracks will start to appear in the oxide layer - an undesirable occurrence when the finishing is applied for a decorative purpose. Also note that bright etched aluminum has a high reflectivity, which decreases slightly when anodizing techniques are used. As an added benefit, anodized aluminum profiles can be melted and recycled with no pre-treatment requirements, whereas a painted aluminum profile will first need to undergo a paint stripping process. Offering a limitless choice of colors and repeatability, powder coating is one of the most wide spread methods of aluminium finishing. In pre-treatment phases, degreasing, pickling the surface and chemical treatments are preformed. Chemical Treatments: Being either chrome-free or chrome-based, chemical treatments are able to deliver a good adhesion as well as an effective resistance to corrosion. With an almost limitless choice of colors, powder coatings are applied to aluminum surfaces and cured without the use of solvents. In wet coating plants, a high level of the paint used is lost through evaporation, but in a powder coating plant, up to 98% of the powder is use. The powder not used is then recalculated via a reclamation system and reused. A good formability which means that it can be formed after the coating process. The process is highly repeatable. Powder coated surfaces are suitable for outdoor use as it has a good resistance to corrosion as well as UV. Abrasions and knocks are withstood far better by powder coated surfaces that wet painted surfaces. Powder coatings have no risk of blistering or running. The coating thickness for this process is usually between 60 µm and 140 µm, and in some cases the thickness of the powder coating has to be taken into account during the determining of the tolerances and the profile's dimensions. Also known as silk-screen printing, this process involves the original design to be reproduced on a transparent film, which is then placed on a fine-meshed screen. From here, it is exposed to develop photographically, after which the screen is fitted into a frame. Either through manual or automatic processes, a squeegee is dragged along the screen, transferring the design onto the printing surface. In cases where lines and extrusion stripes are noticeable on the surface of the aluminum, aluminium finishing is applied in the form of decoration in order to hide these imperfections. Decoration is capable of hiding imperfections. Offers protection against damages that might occur during machining and handling. Offering a more aesthetic, decorative pattern on plain aluminum surfaces, decoration is also able to hide joints elegantly, making it a part of a fluted design. Heat zones can also be used to successfully masked by making use of shadowing techniques.